Giant Orchid or the Queen of the Orchids is listed by the Guinness Book of World Records as the world’s tallest orchid with specimens up to 7.62 m tall. Queen of the Orchids, the largest orchid species in the world is cultivated as an ornamental by orchid enthusiasts. 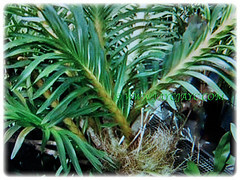 Botanical Name: Grammatophyllum speciosum (syn. 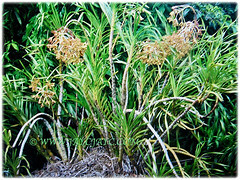 : Grammatophyllum fastuosum, Grammatophyllum macranthum). 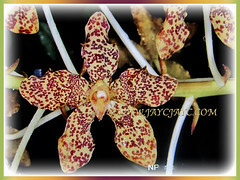 Common Names: Giant Orchid, Tiger Orchid, Sugar Cane Orchid, Queen of the Orchids, Bunga Bidadari in Malay. Etymology: The genus name, Grammatophyllum is derived from the Greek words gramma and phyllon, in reference to the dark and conspicuous markings on the sepals and petals. The specific epithet speciosum comes from Latin for showy, in relation to the striking flowers of this species. Origin: Native to Southeast Asia, Indonesia, Malaysia, Singapore, Papua New Guinea and Philippines. Plant type: A perennial, epiphytic and terrestrial orchid. 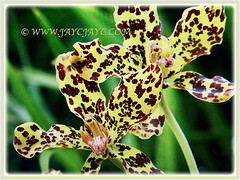 Features: Grammatophyllum speciosum is from the genus, Grammatophyllum that comprises of 13 currently known orchid species. It is an epiphytic and occasionally a lithophytic plant, forming spectacular root bundles. It is a large, clumping and epiphytic giant orchid that grows up to 3 m tall and weighs two tons. 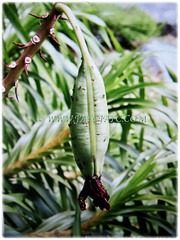 Its stem is 3 m or longer and up to 5 cm thick. Its cylindrical pseudobulbs can grow up to 2.5 m long. Each raceme can grow up to 3 m, bearing up to eighty flowers, each up to 10 cm wide. The flowers are yellow coloured with maroon or dark red spots. These flowers are remarkable as the lowest flowers have no lip and these flowers function as osmophores for the entire inflorescence and continue to emit chemical scent to attract pollinators as flowers open in succession. It blooms only once every 2 to 4 years. This orchid can, however, remain in bloom for up to two months. Stalkless, two-rowed green leaves have thin leaf blades that are strap-like, narrowing and curving downwards towards the sharp tips, and 31-60 by 2.5-3 cm. Leaves are alternately arranged along the long and fleshy stems. Its bisexual flowers, 10 cm-wide are borne on an elongated shoot from the base of the stem. 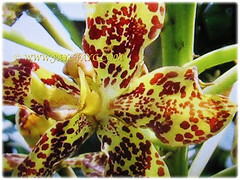 Both its sepals and petals are pale greenish-yellow with orange-brown spots, turning darker when older.The floral stalk is about 2 m tall and carries about 40 long-lasting yellow flowers with maroon or dark red spots. It blooms only once every 2 to 4 years. It is a giant orchid that grows up to 3 m tall and weighs two tons. Because of its enormous size, it is rarely cultivated as this species is usually too large to be accommodated in most greenhouses. Cultivated specimens of this species are always grown as terrestrials, as the plants grow as both an epiphyte and terrestrial in habitat.Its simple brown and dehiscent dry fruit is pear-shaped and are about 15 cm long. The species produce several racemes, arising from the base of the pseudobulb, with many yellow-green to olive-green leaves. The pseudobulbs are enveloped by sheaths. Its pseudobulbs can grow to a length of 2.5 m. Plants can develop into gigantic clusters weighing from several hundred kilograms to one ton. The roots form spectacular bundles. 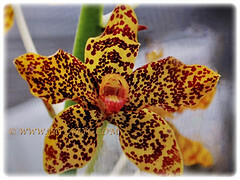 Culture (Care): Grammatophyllum speciosum or Sugar Cane Orchid grows easily with the least maintenance. Moisture: Minimum water needs. Requires occasional misting. However, it needs plenty of water and high humidity during the growing season but less water during the cooler months. Soil: Potting medium must be well-drained, i.e. coarse fir bark, lava rock, pieces of broken pottery, chunks of tree fern, hardwood charcoal, etc. so that the roots can be wet, but then dry quickly. Others: Lime green colored foliage is an indication of proper light. Dark green foliage, while very attractive, is not conducive to the plant reaching its full blooming potential. Yellow colored foliage indicates too much light. It has been observed that dry weather can trigger mass flowering. Feed once fortnightly with a balanced orchid fertiliser with NPK 20-20-20 during the time when the plant is growing more pseudobulbs. Best to grow this plant in a wire or wooden basket. The strong rapid growing root system often breaks ordinary pots. The baskets allow free air flow over the roots and eliminate over watering problems. It does not resent being disturbed, so repotting should be undertaken whenever necessary. The best time is after all flowering has ceased and new growth is just beginning. To minimize root damage, a warm water soak for 10 minutes will make most roots very pliable and easier to remove from the container. Generally free from serious garden pests. For subtropical and temperate regions: Hardiness: USDA Zone – Not available. Grammatophyllum speciosum or Sugar Cane Orchid should be kept at a minimum of 15°C, provided with good light and watered heavily throughout the year, with a slight reduction in watering during winter when the temperature should be reduced to 18°C. Plants will tolerate temperatures to 10°C and up to 38 °C for short periods. At higher temperatures, air circulation and humidity must be increased or damage can occur. 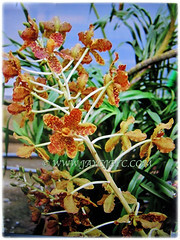 The ideal annual temperature range for Grammatophyllum speciosum orchid are 15 to 25°C. If the temperature is too low or too high, it will affect the growth and development of the plant. In very mild climates, this beauty can be grown outdoors, with protection from the hot summer sun and the colder nights of winter. Fertiliser should be applied regularly throughout the year, with a higher nitrogen content in summer, and with reduced nitrogen but increased potassium content during late autumn to early spring. Once a plant has reached maturity it flowers every two to four years, with flowers lasting for up to two months. In cultivation in temperate regions it flowers less frequently. Propagation: By seeds or by division. Always divide the plants into parts with at least four pseudobulbs and remove any dead roots from the divisions. 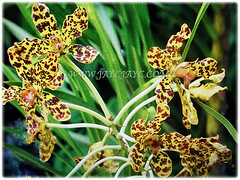 Usage: Grammatophyllum speciosum or Giant Orchid is best grown as an epiphyte but it can also be planted in the ground or in large containers. To grow it as an epiphyte, it can be tied to the trunk of a large tree near the crotch. It is ideal to be grown for its ornamental flowers and ornamental form. Excellent to be planted in public parks and gardens, in flowerbed or border for its attractive foliage and large flowers. 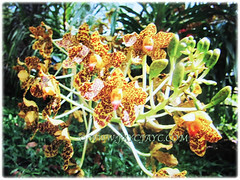 Queen of the Orchids is cultivated as an ornamental by orchid enthusiasts.